Melt the butter with the oil in a Dutch oven or other large, heavy-based pot over medium-high heat. Add the onions and fry with the lid on for 10 minutes until just soft. Lower the heat, sprinkle in the sugar, and cook uncovered for 20 minutes more until caramelised, rich and really tender. The onions should be golden, full of flavour, and soft when pinched between your fingers. Take care towards the end of the cooking that they do not burn. Add the garlic in the final few minutes of the onions cooking time, then sprinkle in the flour and stir well. Increase the heat and keep stirring as you gradually add the wine, followed by the hot stock. Cover and simmer gently for 15 to 20 minutes. Taste to see if it needs a bit of salt and pepper as your beef stock would have been salty, which may be just enough. To serve, turn on the grill and toast the bread on a baking sheet. Ladle the soup into heatproof bowls. Put a slice of toast on top of the bowls of soup, and pile on the cheese. Place the bowls on the baking sheet and grill until the cheese has melted. Serve immediately. Note: If you do not have soup bowls that are ovenproof, simply sprinkle the cheese on the toast and melt under the grill on the baking tray. 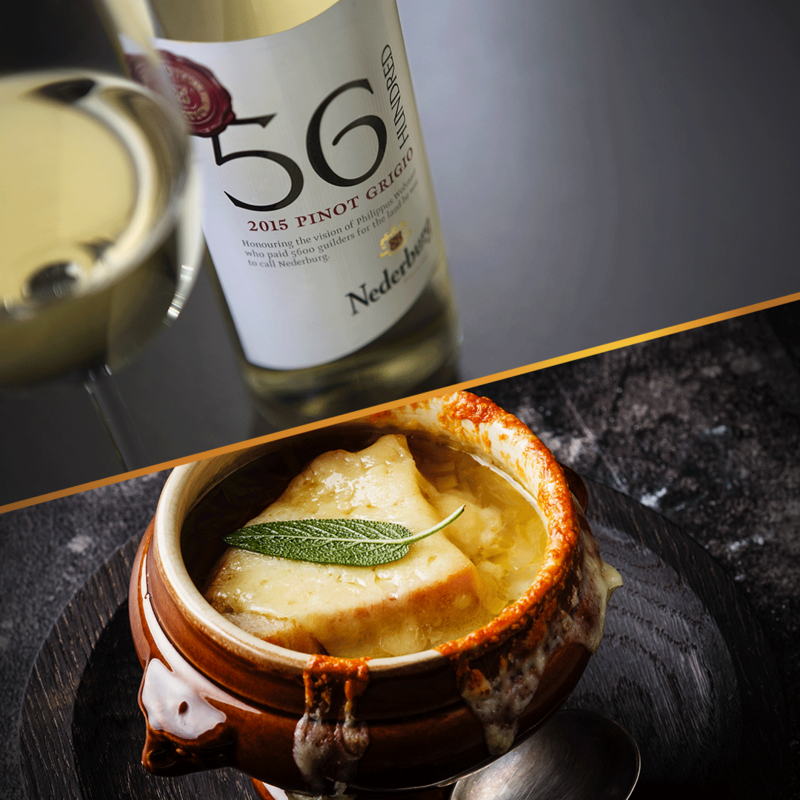 Place the toast with the melted cheese on top of the bowls of soup and serve straight away. French onion soup is probably one of the most epic soups in the world. 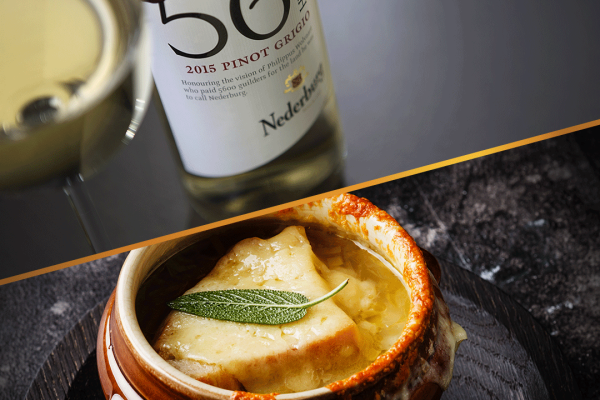 It needs a wine that is smooth and fruity, and easy-drinking, so serve it with Pinot Grigio from the Nederburg 56 Hundred range.